Regalia | Who Were They? I really fell in love with this photo when I first saw it. 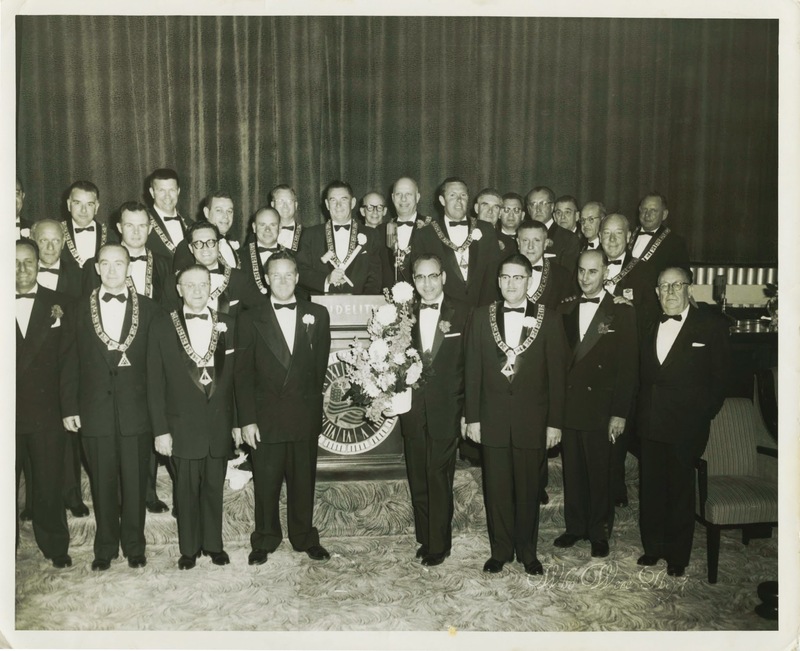 This is an 8×10 black & white glossy photograph of about 30 men in tuxedoes and Masonic regalia. Having no knowledge of the Masons except that it is an ancient order, at first I wasn’t sure it was indeed a photo of Masons. But, looking around right quick, I found this wonderful image which confirmed the type of regalia these men are wearing is in fact Masonic. This is former President of the United States Harry Truman. The necklace he is wearing (if in fact it is called a necklace) is very similar to the ones in the upper image. In the 8×10 above, you can see that some of the medals displayed are in a simple triangle shape, and others are in a shape that I am calling a wonky diamond – it’s the shape created from a compass on top and a square rule on the bottom. For other people, adorned in medals, jewelry and other types of accoutrement, click over to Sepia Saturday. You will be happy you did! I found a similar freemason’s mark on a gravestone in a photo of a cemetery on the Western Front, and a possible “heart and hand” freemason’s mark on the back of a carte de visite. Presumably the photographer was using this symbol to attract custon from other members of the fraternity. im new to your blog and think its great. I have a whole photo album of unknown people. I love the mystery but like to find out more ab out them too. I just noticed the Symbol above ( had not noticed it when I began my note (letter, ha!) That looks exactly what is at the end of the chain on the watch that I was talking about. I’ll have my son take a picture of it to send you, if you’d like? Thanks for all your previous answers. I discovered a lot from “Who Are They?”Again thanks! Accoutrement is a wonderful word. No mistaking that they are masons. The one to the right of the picture should have got rid of his cigarette. I never hear anything current about Masons. Maybe they just don’t like publicity. Yes, even the men knew how to do it right! It’s ironic that men typically don’t “do jewelry” in their daily lives but boy, put ’em in a club and they go to town with some regalia! Interesting selection!! I got interested in the Masons when I read The Lost Symbol by Dan Brown. My father-in-law was a mason and they did a whole ceremony thing at his funeral. Funny we were just talking about “Accoutrement” around there recently. I have family members who are masons and I believe there is more to it than we can assume. Thank you for the ‘wonky’ description – and for giving me the idea for the prompt. My college offered a course just dedicated to the Masons, and that was a 3 1/2 month study that probably just scratched the surface. The handshake. I’ve always tried to find out about the handshake. Nobody will show it to me. I can still remember my sorority handshake from college. I haven’t used it once since 1992 but it’s like it’s burned in my hand’s memory, lol. Those Masons! Great selection on the topic of jewelry, too — it doesn’t matter WHO wears it, does it? Lots of Masons around here — I have a little book that seems to be printed in some kind of code: somebody told me it was a Masonic text! Did you know that Grandpa George was a Mason. I don’t know how many years, but it was quite a long time – he made it to the highest division. It took several years and there was studying or classes of some kind. Gram belonged to the Auxuiliary – it was strictly social. I really know very little about what he did. I didn’t know this! Did U. Chuck wind up with his regalia? Who knows where it is now, I suppose. My Husband’s grandfather Gardner Johnson Snyder was Secretary of the Fidelity Lodge in Ridgewood, N.J. on Maple Avenue in the 1920’s &1930’s I know for sure. I don’t really know how many years total he was there? I also know when he retired he was given a Gold Watch with a long gold chain with a large Masonic Symbol on the end. It is beautiful! It was given to my husband & after my husband died i gave it to one of my sons who was interested in it! …………………………….. You may remember me? Gardner’s mother was Elizabeth Amy Lair (dau. of Edmund P. Lair & Elizabeth Maclone of Frenchtown, N.J.) I had written about & you answered my comment in ref. to the Amy Lair’s picture that was on “Who Were They? “I didn’t know whether she was my husband’s great= grandmother or not, but I knew the lady was related, due to the names in many of the comments. I appreciate so much for all the inf . you sent me on here & E-Mail! I have wanted to write you back in reference to something I am still puzzled over, but haven’t been able too since my genealogy is still in storage – (I thought I would have had it out a long time ago). I was afraid I would make an error? Hopefully, I can explain this so You will understand what I am talking about? …………………………………………………. In the 1850 N.J. Census, Philip & Mary Lair had a bunch of kids (appro.10?) with Amy Lair, being the oldest & John the youngest (according to the census) with John being Elizabeth Amy Lair’s father, & Amy his Sister —- How could she be her (Elizabeth Amy Lair’s) grandmother, as in her will we have? We also have one from Ida J. Hann (Elizabeth A.’s Aunt ) – Mary H. Hann’s sister & several others! These Copies are what I wanted to send you – a copy of, so you will understand what I’m talkng about? Remember you told me her other sister Margeret Hann Married Taylor Salter> I had told you that Amy Lair Apgar also had Salters & others in her Will, even before you sent me the information on the Salters, as well. I believe Ida J. Hann did too? I do hope this makes since? Please excuse errors & what-ever don’t make since write me back for an explanation? I Apologize for this being so long! …………………. I have two thoughts in mind of what could be possible, but my eyes are bothering me right now, so I will write back later & explain what I am thinking of? >>>>>>>>>>>>>>>>>>>>>>>>>>>>>>>>>>>>>>>>>>>>>>>>>>>>>>>>>>>>>>>>>>Before I forget – would you know how Lambert C. Hann who married Sarah “Sadie” Snyder (sister of Gardner Johnson Snyder – in ref. to the Fidelity Lodge & Husband of Elizabeth Amy Lair) is related to Edmund P. Hann – if he is? As you know, this family is all mixed-up in many lines!!!!!! Thanks for all you have done for me previously! Oh, my, the mystery of Amy Lair had slipped my mind but now you remind me, it was rather complicated! I tend to trust wills a tiny bit more than the census documents. Wills are written specifically so family treasures will be directed to the right people. Census takers sometimes had poor penmanship, spelled peoples names wrong, or even just used first initial/last name for long names. My guess in your case, is that there are TWO Amy Lairs – one the grandmother, one the daughter. Your family is also very intertwined with marriages I believe. It wasn’t unheard of for cousins/second cousins etc to marry, and that could really twist the branches! I remember another name in the wills I had mentioned to you previously (from Amy Lair Apgar & Ida J. Hann -) was a Willis KEYSER. That was the other SURNAME, I had mentioned that I could not remember. He was Great-Grandson 0f Lambert & Sadie Snyder Hann, so there must be a connection with the two men – (Lambert C. & Edmond P. Hann) as both wills of Amy & Ida left Willis in them! I have pictures of Willis KEYSER as well (one of him & another relative pretending to be policemen playing around with Baton’s ‘ etc.) & many other relatives in them from my husband’s mother’s pictures. I believe this was Bucks Co., Pennsylvania? LAMBERT HANN Family is RELATED INDIRECTLY on the SNYDER/HANN side & the EDMOND P. HANN Family is DIRECTLY RELATED through the LAIR/HANN – (My husband’s Grandparents). ANYONE KNOW ANYTHING ABOUT THESE TWO MEN? I had read your comment where you had mentioned Lambert Hann and Sadie Snyder and I was wondering what information you had on them? They are my Great-Great Grandparents and my Grandmother asked me if I had found anything out about them because she knew I had been working on our family tree. I’ve found two different sets of information for Lambert. The first one is that his parents were Ida Jane and Lambert and the second is that his mother was Harriet Hann and that she was a widow. The second one sounds right because my grandmother was told that he didn’t have a father in his life but I’m at a standstill. Anything you know would help tremendously! Jami, I apologize! We ended up w/ company out of town & they just left. I will try to give you the highlights for now of what I know from memory (my Genealogy, Pictures, Heirlooms, etc.,& etc. is in storage right now& of this family, as well as others!) – WILL GIVE YOU MORE DETAILS LATER – SOURCES, DATES & ETC………………….. He married SARAH M.SNYDER (my husband’s grandfather’s sister – mentioned above) Their children were OLIVE E., ALICE G.., ORVILLE,, I believe another? We were also in contact with Jimmy & his wife Sylvia & kids up until about 2004 (lost contact, due to moving, I assume? – will explain more later) they were at Two of our daughters weddings in 1996 & 1998. Olive Married Charles E. FOSTER (a daughter, Evelyn Eick). More info later! When we were in contact with them, they lived on Main Street in Pennington, N.J. In childbirth having Ida?) FINISH LATER. Again I apologize. -excuse errors! Oops! Correction – I believe Alice died in childbirth having Ida? Would your grandmother know anything about that? What is her name, if you don’t mind me knowing in case I have ran across it in some of my “stuff” years ago? The DEED had names of descendants > down to my husband’s mother. I meant to ask you also. “HOW is your grandmother connected?” If Lambert & Sadie are her grandparents, which of their children did she descend from? Do you know any of the ones I have mentioned above? It seems there is another child, but mind’s gone blank? ha! There is also a nephew with a Hotel and he and his wife have a sight-seeing business, best I can remember? OR – at least heard about. This family really is confusing! The other daughter of LAMBERT HANN and SARAH SNYDER is EDITH HANN (1904-7/8/1969) who married JOHN HAROLD WHITEHEAD (12/25/1901-11/21/1978) on 7/2/1927. ORVILLE HANN (3/2/1902-12/7/1970) married GERTRUDE ROOKS (9/13/1906-7/3/1996). They had 4 children DORIS HANN, NANCY HANN, JOAN HANN and ROBERT ORVILLE HANN. DORIS HANN married LOUIS WESTPHAL and they have 1 daughter. NANCY HANN (my grandmother) married RONALD TILLETT and they have 5 boys. JOAN HANN was born in May of 1935 and died in February of 1936. ROBERT ORVILLE HANN (12/29/1939-12/20/2000) married PATRICIA RUDEBOCK and had 3 daughters. WILLIS KEYSER went missing on 9/11/1945 and was found on 9/13/1945 murdered. They had one suspect but couldn’t prove he had done it so it’s still a cold case. My grandmother (NANCY HANN) had gotten a copy of the police report from Lambertville, NJ police department and when she tried to get more information from the state police, they said they didn’t have a record of it. I’m a little confused about the STANGLE/KEYSER family because my grandmother’s memory isn’t what it used to be and she gets herself confused sometimes. What she told me was the IDA STANGLE had 3 illegitamate children with a married man from New Hope, PA. She gave me 3 names, (listed oldest to youngest) WILLIS KEYSER, ALICE KEYSER and JOHN KEYSER, but then she said JIMMY KEYSER. I know Jimmy and Sylvia and the kids because we went to school together and I knew we were related I just didn’t know exactly how and I’m still not 100% sure. If you could help me sort this out that would be super helpful, if not I could try to see if Melissa would be able to help out. If you don’t mind me knowing, was your husbands mother’s name OLIVE IDA SNYDER? I have a court summons that I borrowed from my grandmother listing a lot of heirs of ELIAS JOHNSON pertaining to a piece of property in KINGWOOD TOWNSHIP, NJ. I have read your comments and I see that you stated GARDNER JOHNSON SNYDER’S wife was ELIZABETH AMY LAIR but on the court summons I have it states that his wife’s name was LOUISE. Was LOUISE a second wife? I had no idea that ELIAS JOHNSON’S wife was DUTILLA GANO and neither did my grandmother so THANK YOU for that! The court summons I was talking about has A LOT of information on it including DOD’s, addresses at that point in time and a bunch of names that are descendant’s of ELIAS and DUTILLA. If you want more information on that, let me know! Yes, Gardner was married twice. His 2nd wife was Louise Yeager Gardner and they had a daughter, Carolyn born in 1937. We were in contact until she died in 1978. She married a Pugsley & had 4 kids. I lost contact after her death – just found her kids a couple years ago and they are scattered all over the country, like mine are – (more on them later if interested?) Some people who starts genealogy wants everyone in family & others just want the direct line! The Tillets sound very familiar to me. It seems like Ida & Olive mentioned them when they visited us & gave us an address of a Tillet couple, but can’t remember why, other than more info. on family? I forgot to tell you, I will be glad to pay you for the copies, let me know how much? Thanks! I will write again as soon as I remember what else I it was that I wanted to tell you today. I tried to keep it as short as possible, but hard to do – I still didn’t make a dent as there is so much that it’s hard to know what is the most important? I have discovered the things I wan’t even interested in to begin turned out to be the most important! THIS IS A SMALL WORLD! I just found your grandparents names, Nancy & Ronald Tillett & address . . . on N. Main Street in Lambertville, N.J. in my old telephone book I’ve had since 1970’s. Beside their names, I have Orville Hann Sr. & Orville Hann Jr. underneath their names. I have no idea why I have it unless Olive or Ida gave it to me, but if your grandmother don’t know them that well or vice- versa, it wouldn’t make since? I will try to remember more about this? Ask her if she ever remembers hearing from me or my husband “Jimmy” James William Carr? Yes , his mother was Olive Ida Snyder Carr ( hus. James Entwisle Carr) – her sister was Ethel Snyder Hardecoph ( hus. John Hardecoph). Elias Johnson/Johnston & Duittilla Gano was my husband’s great- great grandparents instead of 3rd.. Great-Grandparents. Jami, please forgive me for writing so much, but when I remember something else, I feel I need to tell you before forgetting it (remembering the days when I started I wanted everything I could get!) as I am 77 now! – no young chick anymore! Is there ANOTHER Charlotte in the family? Olive (Foster) & Ida (Stangle) gave us some picture when they visited us, they were taken about the 60’s or 70’s oF a Birthday Party w/ a lady name Charlotte( looked to be in her 30’s or 40’s, maybe, even younger? (That’s when my Glacauma first started in 1977.) – sitting around a table with a slew of kids from all ages blowing out candles & etc.on a cake. There were others of John KEYSER & some kids as well. – many others. – some I believe of the WHITEHEAD REUNION? Thank you so much for all of this information! Every time I find something new about my genealogy I get really excited so anything you know will be wonderful! My email is jay6175@hotmail.com and I’ll send you a copy! The only Charlotte that I have come across is Charlotte Patricia WILLIAMSON. I only know about her from looking over the summons that my grandmother received. JAMI, I have Emailed you several times -sent MY ADDRESS & ask for PRICE of the COPIES, so I could send it to you. Until I get YOUR ADDRESS I can’t even guess at the price, ha! OR I would have already guessed at it. ( sending more than most places charge!) I APOLOGIZE IF YOU SENT your address & some reason I didn’ t recieve it? Oh! Do you think that your Grandmother’s brother Robert Orville Hann could be the ORVILLE HANN JR. IN MY ADDRESS BOOK? Seems possible? ???? If you have sent an Email & I didn’receive it, let me know? I still don’t know where to send the money for copies! Thanks……. IN REF. TO LAMBERT HANN & EDMUND P. HANN connections to the family is that Lambert married into family ( sister of Gardner Johnson Snyder), Sadie Sarah Snyder. Edmund p. Hann was grandfather of (1st. wife of Gardner Johnson Snyder) “Lizzie”, Elizabeth Amy Lair. If Edmund & Lambert are related to each other, I have not been able to find the proof! Hopefully on day I will? CORRECTION! Ida was living w/ her Grandparents when her son Willis was a year old – not parents. Sorry! Jami, I just found this after you told me your grandmother had died; I am so very sorry & do hope you received my Sympathy Card? I was’t sure it was right address, as I found it on line, I believe? Actually, I believe that these gents are BPOE, better known as the Elks. (Belevolent Protective Order of Elks) It’s hard to see the particular symbols on their collars, but the big clock on the podium is set at 11, which is one of the most common symbols of he Elks, referring to the 11o’clock toast to missing brothers; and “Fidelity” is one of the principles of Elkdom, but is not a word you will find (with any prominence) in Masonic ritual or parlance. These chaps are definitely Elks! OOPS! ERROR again! Elizabeth Amy Lair, wife of Gardener Johnson Snyder was daughter of JOHN LAIR b.1847 & MARY HANN b.abt.1853 ~ NOT Edmund P. Lair & Elizabeth McClone- they are her grandparents, instead)! I apologize! I knew this; an oversight instead! Edmund P. Hann & Mary Mclone are Mary Hann’s parents! ( SEE 1870 N.J. Census!) others 1860, 1880 &1890!